You must acknowledge this Terms & Conditions, your electronic acknowledgement acts as our rental agreement. Receipt of these Terms & Conditions with your confirmation when your reservation was made through an outside website (e.g.VRBO/Airbnb) constitutes a binding agreement and rental contract. Thank you for renting your vacation property through Gulf Coast Getaways (referred to as GCG throughout this document). We are honored to have you. The following is important information regarding your rental. Please read it carefully and be sure that you understand it. These policies and rules apply to all vacation rentals at all times. Rental Down-Payment: A 30% down-payment per rental reservation is required at the time of booking. This down-payment is subtracted from the balance which is due in full 60 days before your arrival (for Houses) and 30 days before your arrival (for Condos/Townhouses) . Visa, Master Card, Discover and American Express, are accepted forms of payment. Regular checks can be mailed and also accepted over the phone. Damage Waiver: The Damage Waiver fee you have paid covers accidental damage up to $2000 for houses and $1000 for condos/townhouses. This damage waiver is only for accidental damage and does not cover the following: reckless treatment of property, excessive mess requiring additional cleaning time and/or effort, intentional damage (e.g. punching hole in wall), missing items, theft, and anything beyond accidental damage. Accidental Damage which exceeds $2000 or $1000 respectively, and all damage determined not to be accidental will be charged to the card on file. We reserve the right to collect a refundable damage deposit at management discretion in addition to the Damage Waiver for any groups/individual which may provide a greater risk to the property - some examples but not limited to would include: college age groups, wedding/event parties, bachelor/bachelorette groups, etc. CHECK-IN: CHECK-IN time is 3:00 PM (CT) for condos and 4:00 PM (CT) for houses/townhouses. And CHECK-OUT time is at 10:00 am (CT). These times are strictly enforced to allow for preparation of our next arrival. A late checkout fee of one day’s rent will be charged for failure to comply with the 10:00 a.m. check-out time. CHECK-OUT PROCEDURES: Check-out time is 10:00 am on the day of departure. All guests and belongings must be out of the unit as housekeeping arrives promptly to prepare for the next guest. Late departures must be authorized by GCG and are not permitted in the summer months. Remove all food from refrigerator and wash and put away all dishes. Leave furniture arranged as you found it. Put garbage in sturdy plastic garbage bags and place them in the outside trash cans provided. Close and lock all windows and doors. Turn off all lights. Please leave the property neat and orderly. Reservations: In order to reserve a property, you must be an adult, age 25 or older. Exceptions to this rule must be cleared by GCG management directly. Identification and proof of age may be requested. Additionally, there must be at least one adult, age 25 or older, for every four persons under the age of 25 occupying the unit during the reservation. Any failure to abide by this policy may result in the immediate termination of the rental, removal of the individuals from the property, and forfeiture of any deposit and/or monies paid. Cancellation Policy: In the event that you cancel your reservation, such cancellation must occur no later than 60 days prior to the start of your rental period. Under such circumstances, a $500.00 (Houses) or $300 (Condos/ Townhouses) cancellation fee will apply but you will receive a full refund of all monies paid (less the cancellation fee). However, there will be no refund of any monies paid if you cancel your reservation less than 60 days prior to the start of the rental period. In order to protect the loss of your rental payments if you have to cancel with less than 60 days’ notice, we recommend travel protection insurance. Vacation Rental Insurance: Vacation Rental Insurance protects you against travel interruptions/cancellations due to events such as illness, weather and other unforeseen circumstances. This is an optional plan, but we strongly recommend it. In case of any unforeseen events, this insurance helps protect your vacation investment. IF YOU CHOOSE NOT TO PURCHASE VACATION RENTAL INSURANCE, YOU WILL NOT RECEIVE ANY REFUND OF MONIES PAID IN THE EVENT THAT YOUR VACATION PLANS CHANGE. Vacation Rental Insurance is your only protection for catastrophic weather events such as Hurricane or Tornado, or some other "Act of God" For questions in regard to the coverage offered by CSA, please call 866-999-4018 (Refer to product number G-330). You may review the certificate of insurance on the company’s website at www.vacationrentalinsurance.com/330CERT. Posting of Reviews Policy: No negative review can be posted, published, or submitted without approval from Gulf Coast Getaways, this includes any review less that 5 stars or equivalent to any website, social media, or electronic media. Reviews cannot be used to negotiate refunds or used as threats for refunds. WEDDINGS, PARTIES, AND OTHER GROUP EVENTS: Weddings, parties, and other group events require an advanced approval and reservation. Limitations in size apply and additional fees and security deposit will be required. An additional Guest Rental Agreement & Policies stating these requirements will be sent and must be signed before approval is given. REPAIRS & REFUND: Our maintenance / housekeeping staff is here to make sure your vacation unit is in the best condition possible. If you should discover otherwise, please report it to us immediately by texting our concierge at 850-417-8054 and we will correct it as quickly as possible. However, no refunds will be given for appliance failure, outages of electricity, gas, water, cable, or telephone service. Air conditioners, and hot tubs/Jacuzzis are not guaranteed and refunds cannot be given for failure or breakdown. GCG will make every effort to have them repaired as soon as possible. GCG and/or an authorized employee or repairman may enter the premises during normal business hours for any purpose pertaining to repair, improvement, care, and management of the premises. GCG will make every effort to notify you ahead of time. AFTER HOURS EMERGENCIES: There is an agent on call after hours for EMERGENCIES only. Non-emergencies will be noted and handled the following day during office hours. The after hour emergency number is 850-530-6787 or 850-417-8054 and press #4 for maintenance. Housekeeping: The property will be fully cleaned prior to your arrival and after your departure. No maid service is provided during your stay. We ask that you abide by the cleaning guidelines provided upon your arrival. Properties which are left excessively dirty and which require additional cleaning services will be subject to an additional cleaning fee being charged to the Renter. Linen/Towels/Supplies: Sheets, bath towels and kitchen towels are provided. Please bring your own beach towels and beach blankets. Linens must not be removed from units and/or houses. Renter will be charged for any missing and/or damaged linens. Renters should supply their own paper products and supplies. A complimentary set-up of trash liners, bathroom tissue and facial soap is provided. Renters must provide any additional items as needed. Locked closets are maintained by homeowners solely for their personal use. Please respect these areas. A $100.00 fine will be charged if any owner’s closets/cabinets are forced open. Furnishings and Equipment: All rental properties have fully equipped kitchens, coffee makers, dishwashers, color TVs, microwave ovens, DVD’s, central heat and air conditioning. Please do not rearrange the furniture, take any items outside that are part of the interior decor, or move any furnishings or kitchen items to another property. You will be charged if the housekeepers have to rearrange the furniture after your stay. Locked closets are maintained by homeowners for personal use. Please respect these areas. Internet Service: Internet service is provided as a courtesy and is not guaranteed. This is provided by the individual owner or condo association. GCG is not staffed or authorized to troubleshoot internet interruptions or outages. It is important to note that this is a limited service which provides basic internet searches and can fail due to high winds or storms. If internet service is imperative during your stay GCG recommends you provide your own "hot spot". PETS: Some of our properties are pet friendly. Pets are only allowed if the unit has advertised as such and the non-refundable $175.00 pet fee per pet has been applied in the rental agreement. If any pet is discovered on any property without prior authorization or notification the penalty is a $500.00 charge per pet for extra clean up and flea treatment. The Santa Rosa and Escambia Island Authorities do not allow pets on the beach. Smoking: Smoking is not allowed in any of our properties. If you violate this rule in any manner, a minimum fee of $350.00 will be charged. Additional fees may also apply and Renter will be charged for any costs incurred with regard to returning the rental property to its original condition. Unit Substitutions: On very rare occasion(s), a property that has been reserved will become unexpectedly unavailable. In the event that this occurs, Gulf Coast Getaways reserves the right to change Renter’s reservation to comparable or better accommodations. In such an event, Renter will not incur any additional fees or rental costs. Bad Weather: The rental property is located on a barrier island in a semi-tropical climate and, as such, severe weather events such as tornado, hurricanes and thunderstorms are not uncommon, especially during the months between June and September. Because such weather can be difficult to predict with much certainty, Renter is strongly encouraged to purchase the Vacation Rental Insurance referred to previously in these policies and available to Renter for a relatively small fee. In the event that Renter chooses not to purchase such insurance, should the Renter’s stay be canceled, shortened, or otherwise negatively affected due to bad weather, Renter will NOT be entitled to a refund of any monies paid. Parking: You may park in designated areas only, and if your rental unit requires a parking pass it must be displayed at all times. Renter will be liable for any parking fees or fines that are imposed. If you have any questions about parking, please ask us before you arrive. Grilling: Charcoal grilling and open fire grilling is not allowed on or under decks, balconies or porches, or within ten feet of any island structure. Please check property for designated grilling areas and limit all grilling activities to these areas only. Garbage Removal: Please place household trash in appropriate receptacles, trash chutes, on-site dumpsters, or in covered outside containers provided. Trash pickup days will be specified on a sign inside the property. If trash is not emptied when a Renter departs, and is instead left at the property, additional cleaning charges may be assessed. (ii) Renter, with the intention of binding itself, its successors, legal representatives, directors, stockholders and/or assigns, as the case may be, hereby releases and forever discharges Gulf Coast Getaways (including its members, agents, officers, directors, employees, or other representatives) and the owner of the rental property (including its members, agents, officers, directors, employees, or other representatives), and indemnifies and holds such persons and/or entities harmless from and against any and all liability, damages, actions, causes of action, claims, losses and/or expenses (including but not limited to attorneys' fees, court costs and expenses) arising in connection with or based on injury to or death of any person, or damage to property, including the loss of use thereof, caused in whole or in part by Renter or any member of Renter's travel party, including without limitation visitors or invitees of Renter, regardless of whether or not caused in whole or in part by the negligence of Gulf Coast Getaways or the owner of the rental property; provided, however, this indemnification shall not apply with respect to losses arising directly from the willful misconduct of any one or more of the indemnified parties. Collection of Monies Owed: In the event that renter fails to pay any amounts due to Gulf Coast Getaways and in the event that a lawsuit is filed to collect such monies, Gulf Coast Getaways will also be entitled to collect all of its attorney’s fees and legal costs against renter. In any such lawsuit, the laws of the State of Florida shall apply and the sole venue for such lawsuit shall be Santa Rosa County or Escambia County, Florida. Noise / Disturbances: Renter shall ensure that televisions, stereos, and all sound producing devices are used in a manner which does not disturb neighbors or residents. Any failure to abide by this policy may result in the immediate termination of the rental, removal of the individuals from the property, and forfeiture of any deposit and/or monies paid. Lost & Found: If there are any personal items that Renter mistakenly leaves at the Property after departure, such items may be mailed to the Renter at a charge of $45.00 plus the cost of shipping. 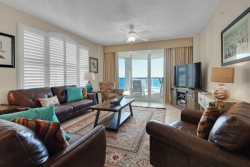 Otherwise, unless Renter makes such a request to Gulf Coast Getaways within 30 days of Renter’s departure, Gulf Coast Getaways has no obligation to store such property or to notify Renter and may dispose of such personal property as it deems appropriate. Pricing Errors:On rare occasion our website will give an inaccurate price due to software mistake/input error. We reserve the right to cancel any reservation when this occurs. These rare occasions are typically discovered within the first 48 hours of the reservation and the renter will be notified asap. The Renter hereby agrees to each and all of the rules and policies above. The last and most important rule: Please have an outstanding, relaxing, peaceful, and memorable beach vacation! Thanks for letting us help plan your trip!